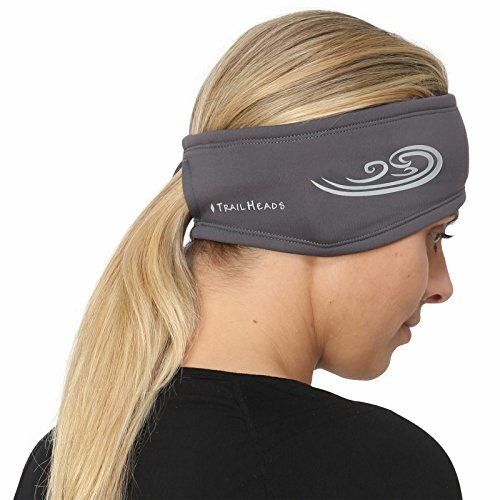 Keep your hair in place during workouts with TrailHeads Women's Ponytail Headband! The polyester spandex headband provides 4 way stretch to ensure the perfect fit! The fabric is lightweight and highly breathable. Featuring a soft brushed interior, the Power Running Headband is comfortable and warm. Its moisture-wicking properties keep sweat out of your eyes and off your face so you can focus on your workouts. The understated ponytail opening makes this stylish running headband a great choice for women with long or short hairstyles. Measuring 3" in front and 4" over the ears, it's designed to fit most head sizes. Its contour shape provides complete ear coverage that keeps you warm in cold temperatures. It's also light enough to wear during cool fall or spring runs. This woman's headband is the perfect under helmet ear protection for activities such as bike rides, horseback riding, or skiing. Whatever your favorite cold weather outdoor activities are this ear warmer for athletes has you covered. This ponytail headband is available in a variety of solid color options. In addition we offer a version that features a 3M reflective "whirlwind" accent that allows you to be safe and be seen while enjoying early morning or late afternoon running workouts. Add the TrailHeads Women's Ponytail Headband to your exercise accessories and enjoy the benefits of excellent moisture wicking management and hair control. 4-WAY STRETCH - The polyester/spandex with 4-way stretch, premium quality fabric of this sweat wicking headband is highly breathable and is water resistant. The brushed fleece interior feels soft and cozy against the skin. CONTOUR FIT - The contoured shape provides full ear coverage, keeping you warm and delivering protection where it's needed most. This running headband is warm enough for chilly winter days but also lightweight enough for cool fall and spring workouts. Measures 3" at the front and 4" over the ears; one size fits most. PONYTAIL COMPATIBLE - The slit opening allows you to easily slip your hair through and provides a "snug solution" for your workout. It's the perfect long hair headband, but can also work well for non-ponytail wearers. The form fitting styling is a great choice for extra warmth under a helmet. CHOOSE YOUR OPTION - This Women's Ponytail Headband is available in a variety of solid color options; in addition we offer a version that features a 3M reflective "whirlwind" accent that provides enhanced visibility for early morning and late afternoon workouts. Check out our product images to view the entire assortment. TRAIL TESTED GUARANTEE: Your complete satisfaction is our goal. If you're not happy with your purchase, let us know and we'll provide a replacement or refund - no fine print, no time limit. Nothing but our commitment to do what it takes to satisfy our customers. If you have any questions about this product by TrailHeads, contact us by completing and submitting the form below. If you are looking for a specif part number, please include it with your message.